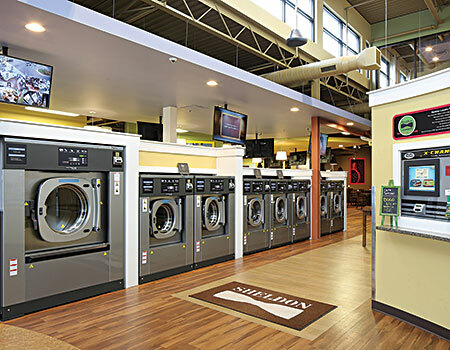 Continental ExpressWash Washers and ExpressDry Dryers ensure customers a 60-minute wash/dry/fold, owners of The Laundry Room Café say. A view of crêperie and coffee shop Café Louie. KENTWOOD, Mich. — “It was something I could do,” says George Cares, of launching Sheldon Cleaners, in 1949. During its 66-year history, the Kentwood, Mich., company has reinvented itself multiple times; embraced and eliminated revenue streams; and overcome economic and industry-specific hurdles. Today, George’s sons, Louie and Paul, lead the enterprise. While Sheldon Cleaners remains grounded in the mission and culture George created—one of quality and convenience—it’s morphed into a multi-faceted business encompassing several revenue streams and customer-focused services. The newest addition? A high-speed vended laundry. 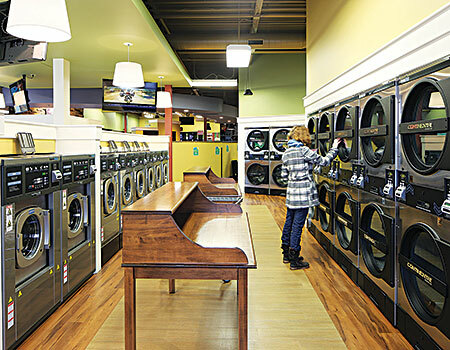 With the help of Michael “Stucky” Szczotka, owner of commercial laundry equipment distributor Eagle Star Equipment and a vended laundry owner himself, the Cares brothers designed a cozy and hip laundry. It offers semi-private areas featuring clusters of laundry equipment, Amish-made folding tables, Wi-Fi, TVs and kids’ play areas. The laundry also encompasses a dining area with an indoor-outdoor fireplace; and Café Louis, offering crepes of all types, wraps, sandwiches, salads, muffins and a full menu of coffees, lattes and mochas. The new laundry is attached to Sheldon Cleaners and features a convenient drive-up door. 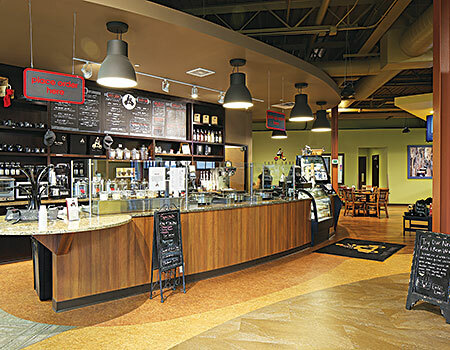 The Laundry Room Café was developed to be an added revenue generator, but having fun with it was essential to its owners. Immediately, the new laundry spurred an unexpected 30% surge in over-the-counter drycleaning sales at that location. Drawing attention to the store—and making passersby smile—is a “steaming” coffee cup that’s 10 feet in diameter. It is affixed to The Laundry Room Café’s rooftop. Szczotka recommended a mix of high-speed Continental laundry equipment, including card-operated Continental ExpressWash Washers and ExpressDry Dryers. Thus, The Laundry Room Café touts three 90-, six 55-, eight 40-, 10 30- and 12 20-pound ExpressWash Washers; five 45- and 13 30-pound double-pocket stack ExpressDry Dryers; and six reversing single-pocket 75-pound Continental dryers. “All of the washers are freestanding, stainless and high-speed,” says Szczotka. Equipped with the ProfitPlus Control, the washers feature four primary cycle options: Superwash, an extra-long cycle for heavy soil; Hot, for whites; Warm for colorfast and permanent press items; and Cold for colors. They allow customers to add an Extra Wash, Extra Rinse and/or Delicate Cycle. Anytime an “Extra” is selected, it adds to overall revenue. The ExpressWash Washers produce extract speeds up to 384 G-force, according to Szczotka, so they remove more moisture from every load when compared with traditional hard-mount washers. “Laundry comes out of the washers nearly dry,” he says. “This shortens dry time by up to 50% and allows customers to get in and out of the laundry in less than 60 minutes.” Dryers run less often, which conserves natural gas and electricity—cutting operating costs. Meanwhile, the Card Concepts card system seamlessly communicates with the ProfitPlus Control, allowing the Cares brothers to quickly tweak vend prices and programs on multiple machines simultaneously. From a cell phone or remote computer, using the Internet, they can also track revenue and turns per day; run operational reports; execute pricing specials and promotions; and build customer loyalty. While the self-service side of the business is humming, full-service wash/dry/fold is also gearing up. So is the newly developed Café Louis. And like George, Paul and Louie infuse that quality commitment into all they do. “Dad always said you have to work harder than your competitors,” says Louie. Opened less than a year, The Laundry Café and Café Louie are expected to deliver a full return on investment in just five years, according to the Cares brothers. Simultaneously, they anticipate that Sheldon Cleaners will enjoy a 10% profit boost this year.